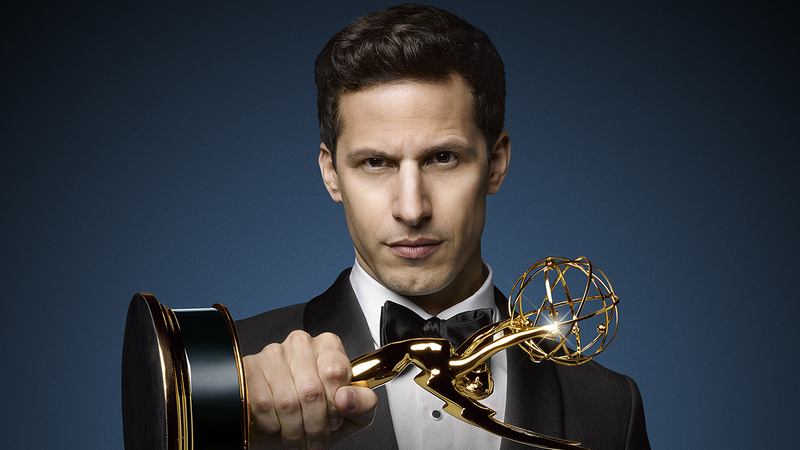 What kind of impact will Andy Samberg have when he hosts the 67th Emmy Awards on Sunday? In the end, not much after you subtract commercial breaks and all the time spent handing out the actual awards. "The truth is that on the Emmys we have 22 or 23 minutes total, because in a three-hour show, we actually have two hours and six minutes of program time. The rest is promos and commercials," said executive producer Don Mischer, who's overseeing his 13th Emmys telecast. "And that's one of the dilemmas for producers—you have to protect the integrity of the institution and honor all those that work in that particular business, and you also have to make a show that's interesting and entertaining and funny for people around the country," Mischer said. "And it's very hard to do that." Save your best for first. Samberg knows that his hosting performance will ultimately be judged on the first segment: the opening bit (whether taped, live or a bit of both) followed by the monologue. "The opening monologue—that whole run—that's really where you get a chance to do stuff," said Samberg. "If I feel like I can walk away from that being proud of it in one way, shape or form, I'll be happy." Don't ignore social media. "One reason that live television seems to be working so well is social media," said Mischer. When he last directed the Oscars in 2013, "we got the study that said 67 percent of the Oscar audience had a second screen in their hand or right in front of them. That's a show with a much older demographic, and that was shocking to me." So Mischer is counting on social media to engage fans and drive others to the show, especially if something unexpected happens on stage. "If somebody tweets you and says so-and-so just fell down at the Oscars or so-and-so did this or that, people will tune in," he said. Don't underestimate the power of In Memoriam. While the annual tribute to the industry's recently deceased always seems to stop the show's momentum, it's more important than many would think. "When you ask viewers, 'What do you like about the Emmys after the host?' It's In Memoriam," said Mischer. "And the ratings spike on In Memoriam. It is a popular part of the program." Get rid of some awards. OK, this one isn't going to happen, at least not this year. But it's the one change Mischer would make to the Emmys if he could. "I would try and remove awards that do not relate as much to the viewing public around the world so that I had more time to focus on comedy and entertainment," he said. "But that's heresy when you're talking to the Television Academy." Keep comedy bits out of the last hour. There's a reason the Emmys' biggest comedy elements are deployed earlier in the ceremony. "By the time you get two-thirds of the way through, it puts tremendous pressure on comedy. People have been sitting there for two and a half or three hours," said Mischer. "When you get to the last hour of the show, my suggestion to all awards-show producers is open the envelopes as quickly as you can, and don't try and be funny, because the audience—they just want to get going." Stop football fans from changing the channel. The average audience for Fox's Sunday afternoon football games last season was 26.9 million viewers. That's 11.3 million more than last year's Emmys audience on NBC. This year, Fox hopes to keep some of those NFL fans from changing the channel by broadcasting its Fox NFL Sunday pregame show from the Emmys red carpet. "It's a huge boost for us," said Samberg, who expects to make an appearance. "If it works, it will seem really smart. The hope, as it always is when you do that stuff where you tease it through, is you just get spillover, and they see something they like and stick around." Meanwhile, Mischer will be rooting for Fox's 4:25 p.m. game between the Dallas Cowboys and Philadelphia Eagles to go into overtime and stretch toward the show's 8 p.m. start time. When CBS aired the Emmys in 2013, its football broadcast went late, ending at 7:59 p.m. and giving the show its highest ratings in eight years. "A lot of people never turned the Emmys off. They just left the sets on," said Mischer. "I'm hoping we benefit a little from that." When the show is over, stay far away from the Internet and social media. Samberg is approaching his Emmys the same way he approached Saturday Night Live when he hosted in 2014. "I stayed offline, and I'll stay offline for this," he said. "If it feels good in the room, I'll be happy walking away from it thinking it went well and not knowing if everyone thought I was terrible. And the truth is, if everyone really thinks I'm terrible, I'll find out."